Local screenwriter, etc. puts on a show that we won't soon forget...even if we wanted to! HALLOWEEN is just days away, so it seems that all the freaks are coming outta the woodwork. 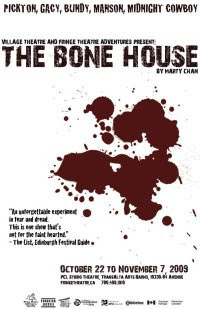 Edmonton writer Marty Chan's The Bone House is no exception, but as we learn in this live theatre thriller, that's just the way we like it! Tuesday night (Oct. 27) was half-price night, so my inner cheapskate awakened and I headed down to Old Strathcona to take advantage of the sale ($11). There was already a lineup when I arrived at the TransAlta Arts Barns' PCL Studio Theatre (10330-84 Ave.) a half hour before showtime (8:00PM). We took to our seats and The Bone House started soon after. There was a projection screen at the back of the small PCL stage, and to the right was a desk with a laptop and speakers. Black curtains surrounded us at every wall, from floor to ceiling, even shading the exit doors. It was a humble theatre, filled with about a hundred temporary seats, almost all of which were occupied. A young gentleman in black dress pants, a white dress shirt & tie jumped onto the stage and excitedly welcomed us to the show in a southern American accent. He asked if we could turn our cell phones completely off and then started re-arranging patrons. After some five minutes the three front rows were all female, and my friends and I had been split up from each other. He assured us it was just part of the show, perhaps tearing us away from the comfort zone of our familiar friends for optimal fear. 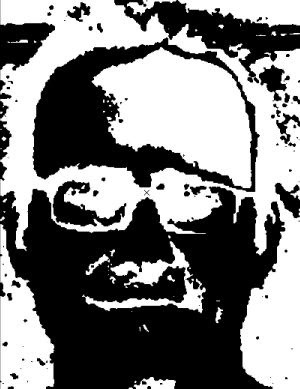 He called himself Eugene Crowley (Chris Fassbender), the "mind hunter," and told us that he was in the business of analyzing whatever it is that goes on within the minds of serial killers. Crowley continued speaking to his audience as such, involving us like no other theatrical project I've been to had. The "mind hunter" showed us grisly images of murder victims of some of the world's most notorious serial killers, whom he referred to as "celebrities." He blames the likes of us for their celebrity, nurtured by our inherent curiosity for who these men were and what they'd become, all the while barely registering a shred of interest for their countless casualties. "I worry that I may panic in the middle of this eerie play that I've unintentionally become a part of"
But Crowley welcomed us to the show for one psychopath in particular, going by the nickname "Midnight Cowboy," alluding to a song from the famous Dustin Hoffman-Jon Voight movie with the same name. The "Midnight Cowboy" had lacked control in his seemingly normal inhabitance, feeding his callous urges to gain control by taking it away from others. His calling card, of sorts, was a second victim at every crime scene who acted as an involuntary spectator to his devilish deeds. Crowley and his assistant Jacob (Kyle Horton) then introduced us to Gabrielle, a survivor of one of "Midnight Cowboy's" savage excursions. The traumatized young lady reluctantly agreed to a hypnosis session for the crowd, her harrowing ordeal bleeding into our imaginations with every torturous shriek and numbing flashback. Crowley goes beyond acceptable tactics to get inside the mind of this killer on the loose, before we transition this lecture-styled play into a potential--albeit pretend--crime scene. Let's fast forward, shall we? The lights have gone out and it's pitch black. There are a couple of (not actual) gunshots onstage, shortly after Crowley suggests that any one of us in the crowd could be a killer...the killer! Staring into blackness, sitting alone amongst a group of people, I start to breathe heavier. I keep blinking my eyes, hoping for a random spark of light to fill me in on what's going on beyond the dark. No such chance. I worry that I may panic in the middle of this eerie play that I've unintentionally become a part of. But I stay calm, as bumps in the night elicit squeals from folks caught offguard. A villainous voice floats across the room, taunting the unsuspecting assembly who thought they came here for something a little more mainstream. A third gunshot had to of jolted the lot of us, before that song from the Hoffman-Voight movie began humming from the speakers. The voice disappeared, the lights came back on, and all that was left was a bloodied garment hanging from the projection screen. The befuddled crowd, abashed at their own fear by this point, remained in our seats, debating whether or not the act had come to its end. "That guy who was sitting beside me is gone," one of the girls behind me said to her friend, perhaps insinuating he was the "killer." By this point, I was just happy to see again! A few minutes pass before we begin to exit the studio, back into the safety of reality, or at least that's what we force ourselves to believe. The Bone House runs at the PCL Studio Theatre from October 2nd to November 7th. For ticket prices and more information click here.